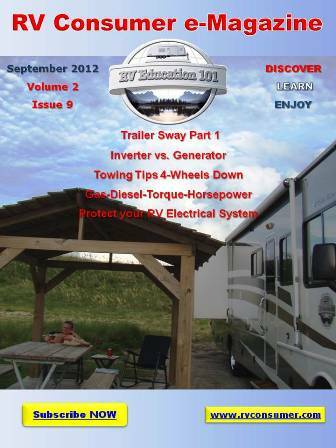 There are basically 3 ways RV owners can check the condition of their RV batteries. 1) You can check the monitor panel in the RV. 3) You can check the specific gravity with a hydrometer. The least accurate of the three testing methods is the RV monitor panel, but if this is your only means for checking the battery(s) it will give you a general idea of the condition. When you check the condition of your battery using the monitor panel make sure the RV is not plugged into shore power, if it is you will get a false fully charged reading. To get a more accurate reading of the battery’s condition check the monitor panel when the RV is not plugged in and turn a couple of overhead lights on to place a small load on the battery. Measuring voltage with a voltmeter has its advantages. If you have sealed batteries your only choice is to use a voltmeter, and measuring voltage can give you a quick picture of the batteries depth of discharge so you know when the batter needs to be recharged. To measure the voltage you need a good digital voltmeter. Set the meter on DC voltage and connect the red lead to the positive terminal and the black lead to the negative terminal. A 12- volt battery that is charged should read 12.5 to 12.7 volts. Readings less than 12.5 indicate the battery state of charge is less than 70% and the battery needs to be charged. A 6-volt battery that is charged should read 6.25 to 6.37 volts. Note: To get an accurate reading the battery should not be tested if it has been charged or discharged in the last 12 hours and preferably 24 hours. 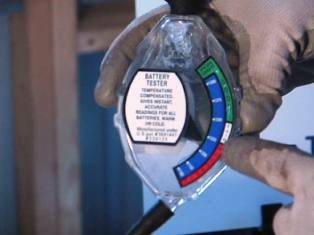 The preferred method for testing the battery’s state of charge is to check the specific gravity reading of each cell. You can purchase a hydrometer at an auto parts store for about ten dollars. The battery electrolyte is a solution of acid and water so you need to wear safety glasses and gloves and avoid skin contact. Remove the vent caps and check the electrolyte levels. There has to be enough electrolyte in each cell for the hydrometer to pick it up. If you have to add any water you’ll have to charge the battery and let it sit for at least six hours before testing for accurate results. Fill and drain the hydrometer at least twice in each cell before taking a sample. Take the reading and record it then drain it back into the cell. Test all of the cells and replace the vent caps. 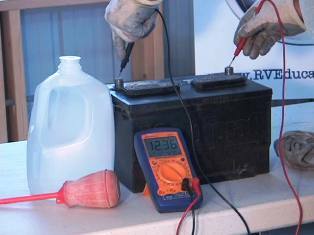 Specific gravity readings for a charged battery should read between 1.235 and 1.277. Specific gravity readings below 1.235 indicate the battery state of charge is less than 70% and the battery needs to be charged. If there is a .050 or more difference in the specific gravity reading between the highest and lowest cell, you have a weak or dead cell in the battery. There are other battery testing procedures, like load testing for example, but for an easy way to check the battery state of charge use one of these methods. Always be careful when you work around flooded lead acid batteries and if you are not comfortable working around batteries take the RV to an authorized RV repair facility to have the testing done.